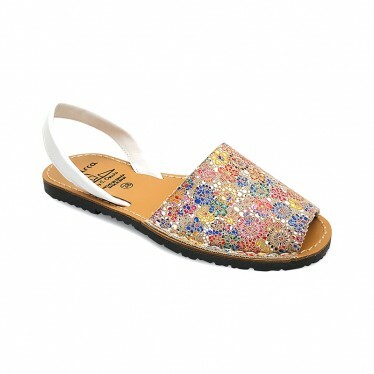 Leather women´s avarcas with flowers prints by C. Ortuño, with 1.50 cm rubber sole. Woman Leather Menorcan Avarcas with naval stripes print in white and navy blue 403AV Navy, by C. Ortuño, with 1.50 cm heel rubber sole. Woman Leather Menorcan Avarcas with naval stripes print in white and red 403AV Navy, by C. Ortuño, with 1.50 cm heel rubber sole. Woman Metallic Leather Menorcan Sandals with naval stripes print in white and silver 403MET Silver, by C. Ortuño, with 1.50 cm heel rubber sole. Woman Metallic Leather Menorcan Sandals with naval stripes print in white and platinum 403MET Platinum, by C. Ortuño, with 1.50 cm heel rubber sole. Woman Metallic Leather Menorcan Sandals with naval stripes print in white and pink 403MET Pink, by C. Ortuño, with 1.50 cm heel rubber sole. 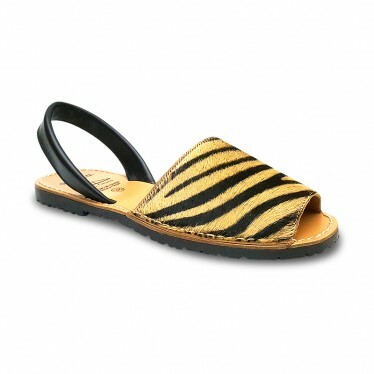 Woman Leather Menorcan Sandals with tiger print in natural hair. Leather avarcas with leopard print in synthetic hair, by C. Ortuño, with 1.50 cm rubber sole. Leather women´s avarcas with prints in serigraphy by C. Ortuño, with 1.50 cm rubber sole. Leather women´s avarcas with fantasy print in black and pink by C. Ortuño, with 1.50 cm heel rubber sole. SEV377 PINK. Leather women´s avarcas with fantasy floral print in multicolor by C. Ortuño, with 1.50 cm heel rubber sole. SEV381AV. Woman Leather Menorcan Avarcas with leaves and "Summer Vibes" legend print SEV404AV White, by C. Ortuño, with 1.50 cm heel rubber sole. Woman Leather Menorcan Avarcas with leaves and "Summer Vibes" legend print SEV404AV Black, by C. Ortuño, with 1.50 cm heel rubber sole. Woman Leather Menorcan Avarcas with mexican skulls print SEV412AV Black, by C. Ortuño, with 1.50 cm heel rubber sole. Woman Leather Menorcan Avarcas with mexican skulls print SEV413AV Blue, by C. Ortuño, with 1.50 cm heel rubber sole.